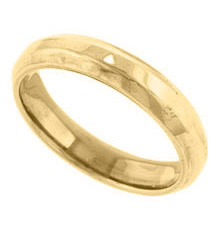 This is a very stylish 18k yellow gold men's wedding band. The 5mm band has beveled edges which decrease the band's bulk for a light and contemporary look. The beveled edges reflect light giving this ring lots of shine.